Romy finished her MACH on 5/15/09 and only a month later we lost her to acute myeloid leukemia. It was a devastating loss. If you want to fight canine cancer, consider making a donation to the fund we have set up in her memory. agility, road trials, public education, tracking, freestyle, and therapy work. This website was developed not just to showcase our dogs but because we are very concerned about the large number of homeless Dalmatians showing up in shelters, pounds, and rescue groups. 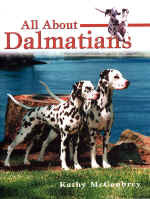 We want to provide as much information about the Dalmatian breed as possible to educate the public BEFORE acquiring a Dalmatian so we offer Dalmatians.US (formerly the Dalmatian Information Station) a site that has complete information on the Dalmatian breed, breeding, training, natural diet, and much more. We have no plans for a litter any time soon.If you are looking for referral to a reputable breeder contact referrals@thedca.org. Please do not ask us for a referral. If you are a new visitor please go to the Table of Contents to see everything that is available on this site. If you are a repeat visitor go to What's New to see what we've added since your last visit. Also check out the page for PDF downloads of public education materials. We offer all breed agility and obedience training as well as behavior modification programs through A Dog's Life Training. If you have questions about the breed please send us an email. We are on dial up so please do not send pictures or attachments unless requested. If you are looking for referral to a reputable breeder contact referrals@thedca.org or visit the Dalmatian Club of America website. If you are looking to adopt a rescue Dalmatian contactdcare@thedca.org or get more information on the Dalmatian Club of America Rescue Education website. Nori completed her MXJ on March 14th. Nori completed her AX on April 9th. Jamie completed his OF on July 24th. Nori completed her XF on August 27th. is owned by Kathy McCoubrey. This BARF - Bones and Raw Food - for Dogs & Cats site owned by Kathy McCoubrey. Copyright 1997-2010. All rights reserved. Website design by Kathy McCoubrey. Unless otherwise noted all the photographs, images, animations, etc. on these pages are copyrighted and cannot be used without written permission from the copyright owner Kathy McCoubrey.